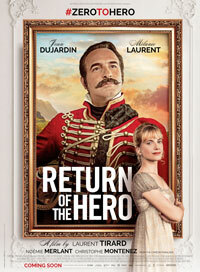 France, 1809: The charming Captain Neuville (Jean Dujardin, THE ARTIST) is set to marry the naïve Pauline (Noémie Merlant) when the war breaks out, forcing Neuville to depart for the battlefield. After not hearing from the captain for months, Pauline grows sick with worry, and her sister Elizabeth (Mélanie Laurent, INGLORIOUS BASTERDS) decides to write letters on Neuville’s behalf to cheer her up. Eventually, Neuville returns home in glory and is welcomed as a hero, but unbeknownst to everyone, he is a penniless war deserter. A suspicious Elizabeth is determined to expose the real Neuville, and the two imposters find themselves in a ruthless fight! With RETURN OF THE HERO, director Laurent Tirard (NICHOLAS ON HOLIDAY) delivers a delightful screwball farce with surprising depth.